CHICAGO (WLS) -- As countries across the world celebrate World Autism Day Thursday, the Blue Man Group is using more than its famous blue facial paint color to support the cause. The group has pledged to donate $25,000 towards the cause in each of its markets. 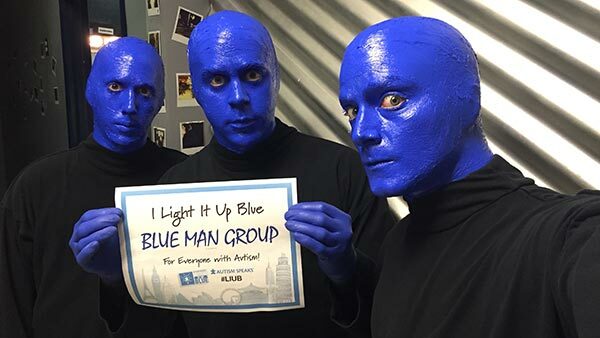 Throughout April, which is also Autism Awareness month, Blue Man Group will also be collecting donations after its performances in Chicago, New York and Boston to benefit local programs with Autism Speaks, a group that fundraises for autism research worldwide. "We've heard from many families affected by autism that their children responded to the Blue Man character in a very moving way. We don't know the exact reason," said Phil Stanton, Blue Man Group co-founder. "We can only speculate that it has to do with the Blue Men communicating in their own unique way - non-verbally, through visuals, touch and sound. Their message often resonates on a deeper, more sincere level." Despite being known as a highly-stimulating visual and auditory show, Blue Man Group will also host at least one sensory-friendly show for children with autism spectrum disorders in each of its markets. Autism affects one in every 68 children, and one in every 42 boys, according to Autism Speaks. The organization promotes awareness of the cause with its Light It Up Blue campaign every year on April 2. For more information and tickets, visit blueman.com/autismspeaks.